I made very simple and quick donabe-steamed gyoza. 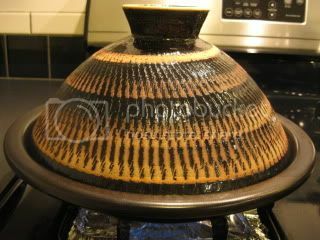 My donabe steamer, "Mushi Nabe", is a great tool, because it makes wonderful steam dishes right on the dinner table. I made some gyoza. The filling is the simple mixture of minced shrimp, kurobuta pork, ginger juice, sake, katakuriko (potato starch), salt and Szechuan pepper. They were arranged in the steaming Mushi Nabe and steamed for about 5 minutes. As soon as the gyoza was ready, they were served right out of the donabe at the table. 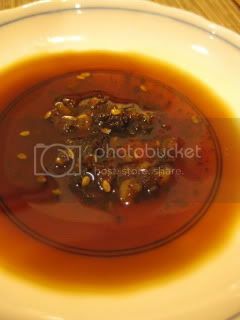 The dipping sauce was the usual combination of soy sauce, black vinegar, and some chunky la-yu (hot oil). So perfect! 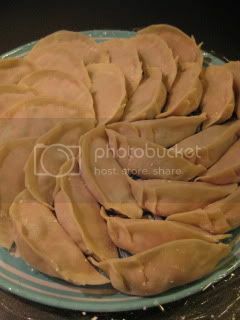 You can make gyoza with different fillings and enjoy different variations. 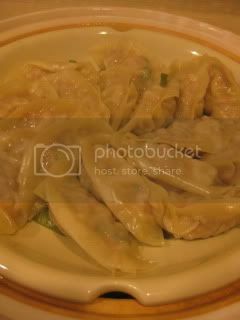 My steamed chicken gyoza recipe can be found in toiro's website. Here's a side salad I made...roasted romanesco and radicchio salad with (home-grown) orange vinaigrette. It was super. I'm back to drinking wine again. After I got flu the end of last month, I couldn't enjoy wine without feeling a little headache for a while. Now, I'm totally fine, so time to compensate for the lost drinking time. 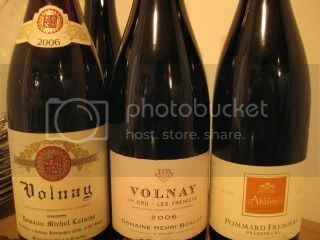 The other day, we didn't plan, but 3 of us brought 3 different Volnay at a dinner. All fablous. 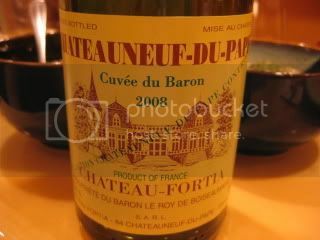 08 Chateau Fortia's C-d-P was really great with yakitori dinner at Torimatsu in Gardena. 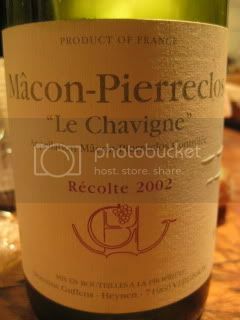 My favorite of the week was 2002 Domaine Guffens-Heynen, Macon-Pierreclos "Le Chavigne'. This wine was sensational. 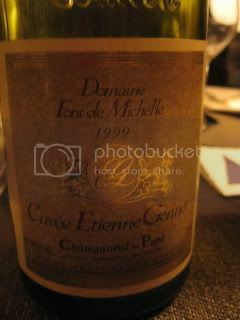 While the majority of Macon is considered to be inexpensive (mostly) casual wine, this single cru Macon stands in the totally different level (and few Macon can taste great after 9 years). 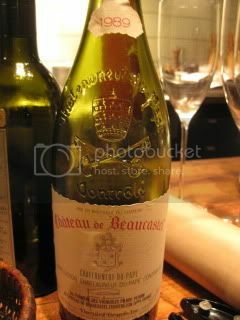 It was like drinking 1er Cru Meursault. This is a small production domaine by Maison Verget's Jean-Marie Guffens. I'm glad I can drink again. The other day, I was just totally uninspired and didn't have any idea what I wanted to make for dinner. My brain was totally blank. That's kind of very rare for me, because normally I have too many dishes I want to create in my head. Even for a time like this, donabe never gives up on me. On the contrary, donabe becomes my savior. I decided to do simple one-pot dish by using ingredients I already have in the fridge with my tagine-style donabe, "Fukkura-san". I very thinly-sliced negi (Japanese green onion - I used white part only) and spread in the skillet of Fukkura-san. 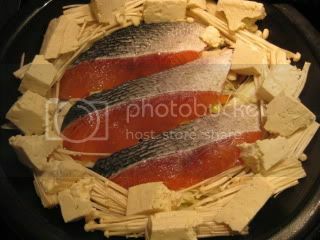 Then, arranged salmon filets (I seasoned them simply with salt & pepper), hand-torn tofu pieces, and some enoki mushrooms. 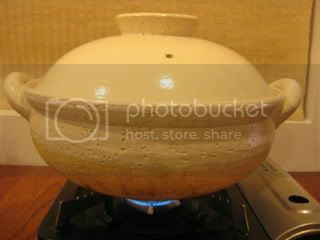 I drizzled about 2 tablespoons of sake over the ingredients, covered with the lid, and put Fukkura-san over medium+ heat for about 10 minutes. The wonderfully aromatic sake-steamed salmon was ready in such a short-time preparation. 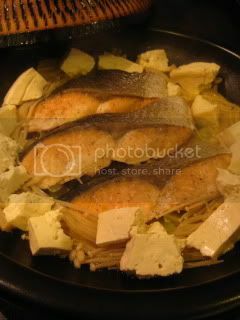 There were only 4 main ingredients in this dish...green onion, salmon, tofu, and enoki mushrooms, and it made the complete main dish. The thinly-sliced negi was nicely cooked down and almost creamy and sweet. To enjoy, I just drizzled some homemade chunky la-yu (hot oil), and served with donabe rice. I had a happy donabe dinner! I made my own version of Dan Dan Mein (noodle in sesame sauce), topped with miso-flavored kurobuta pork. 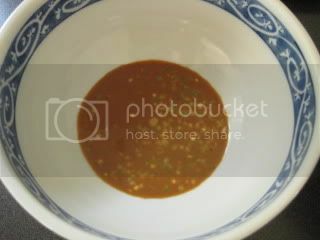 Sauce (2 servings) is 4 tsps sesame paste, 2 tablespoons soy sauce, ½ tablespoon black vinegar, ½ tablespoon la-yu (hot sesame oil), ½ tablespoon sesame oil, 2 tablespoon minced scallion, 1 teaspoon, agave syrup, and some ground Szechuan pepper. They were whisked together and divided into two bowls. For the pork, 3-4 oz ground kurobuta pork was mixed with 1/2T Chinese rice wine and a pinch of salt. It was sautéed in a pan. 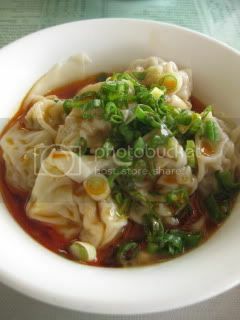 ½ teaspoon minced garlic, 1 teaspoon minced ginger, 1 teaspoon sugar, ¼ teaspoon ground Szechuan pepper, 2 teaspoons each miso and Chinese rice wine were added and simmered. At the end, 1 tablespoon minced cilantro stems were added and stirred. 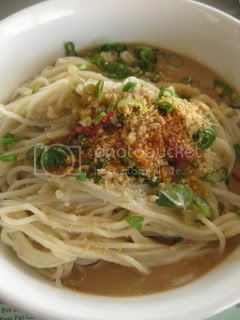 Cooked Chinese noodles were added to the bowl, and topped with the ground pork mixture. 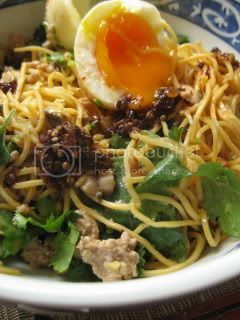 The dish was finally topped with some roasted minced almond, soft-boiled egg, cilantro, and my homemade chunky la-yu (hot oil). To enjoy this dish, all the ingredients need to be mixed in the bowl and eat. It was so perfect and so satisfying! I finally found a good Taiwanese noodle restaurant in LA. The place is called Noodle King…the name doesn't sound like a serious place, but I found they do authentic dishes. 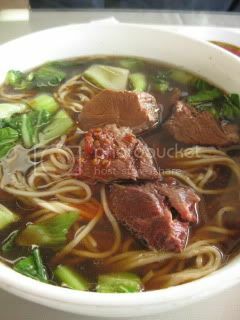 Among the noodle dishes I’ve tried in different Taiwanese restaurants in San Gabriel Valley, their beef noodle was the closest to what I had in Taipei. Wonton in hot oil was very good, too. 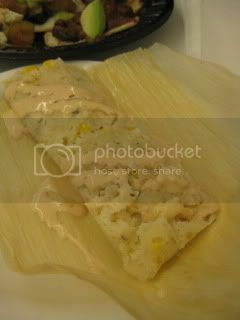 I also thought their Xhao-long-pao was as good quality as our local Din Tai Fun’s. Their Dan Dan Mein (noodle in sesame sauce) was too sweet and too saucy for my taste. 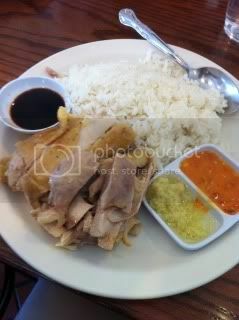 Here’s Hainan Chicken Rice from very popular Savoy Kitchen. It’s just such a nice rustic comfort food. So simple and so nice. 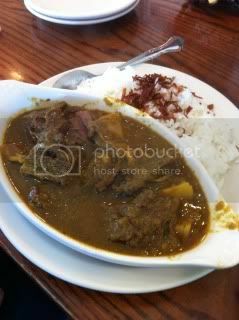 Their beef curry (Malaysian style) and shrimp rolls were also very good, too. Ginjo (soft-style) sake-kasu (sake lees) goes so well with cheese. I'm serious. When I need a snack, I often make myself a small canapé with a simple mixture of sake-kasu and brie cheese. The flavor combination of both fermented products is so unique and so wonderful. I highly recommend you try it, too. 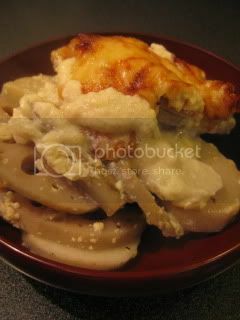 This “sake-kasu cheese” is also great in a salad. I roasted pumpkin and made a salad dish with the sake-kasu cheese. Here’s my recipe. 1. Toss the kabocha in some olive oil, and season with salt and pepper. 2. Spread the seasoned kabocha in a baking sheet and roast in the 450F oven for 15-20 minutes or until it’s tender. 3. Meanwhile, in a small bowl, break the brie into smaller pieces by hand. Add the sake-kasu and mix by a spoon. Set aside. 4. 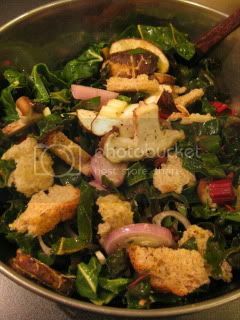 To make the vinaigrette, sauté the shallot and garlic in 1 tablespoon olive oil in a pan. 5. Once the shallot is very soft, add the lemon juice, balsamic vinegar, and currant. 6. Bring to simmer and turn off the heat. Add the rest of the olive oil. Season with salt and pepper. 7. In a large bowl, combine he roasted kabocha, sake-kasu brie cheese, walnuts, sautéed shiitake mushrooms, and vinaigrette. It’s good to assemble right when the kabocha is roasted and still hot. 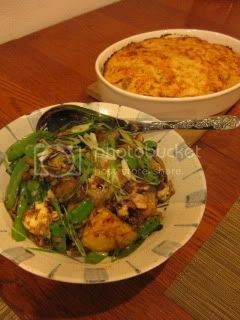 Sake-kasu combo..."Kabocha & Sake-kasu cheese salad", and "Sake-kasu root vegetables gratin". This is my new favorite. It’s an ice cream with sake-kasu (sake lees)! I use soft-type Ginjo sake-kasu for this for the pure sake-ey flavor, instead of hard-press sake kasu. This ice cream is so simple to make, and the flavor is unbelievably rich with the umami from Ginjo sake-kasu. Here’s my recipe. 1. Combine the milk, cream, and honey in a pot. Heat until almost simmering over medium-low heat. 2. In a large bowl, whisk together the sake-kasu, eggs, and ginger powder. 3. Drizzle in the heated liquid in the bowl a little amount at a time and whisk each time. 4. Transfer back the mixture to the pot and heat again over low heat until almost simmering. Stir constantly. 5. Remove from the heat and cool down. Keep it in the refrigerator and chill completely. 6. 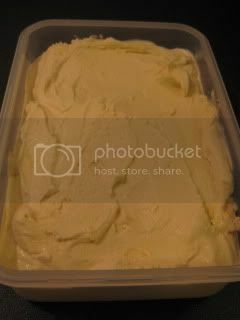 Once the mixture is chilled, use the ice cream machine to make it into ice cream. So creamy and so nice...it's like eating sake. Since I love both root vegetables and sake-kasu (sake lees), I created a dish using both ingredients. 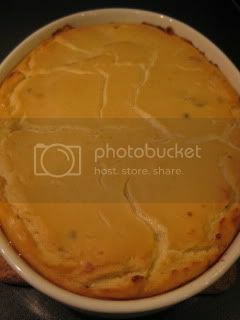 I made sake-kasu gratin sauce, by mixing sake-kasu, tofu, etc. (so it's naturally non-dairy), and baked with root vegetables. The dish was sensational! Making the sauce is super easy. You only assemble all the ingredients on a food processor. 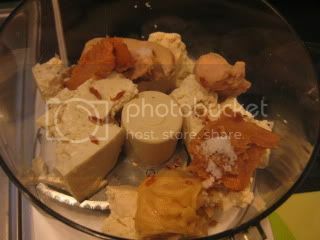 They are sake-kasu, tofu, saikyo-miso (sweet white miso), salt, yuzu rind, kuzuko (arrowroot powder). 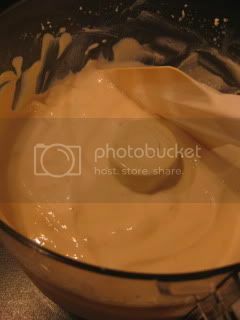 As I blended them in the food processor, I added soymilk to make the mixture creamy and smooth. Rot vegetables and mushrooms were cooked in a pan until tender. They are gobo (burdock root), lotus root, Okinawa purple yam, and eryingi (king oyster) mushrooms. 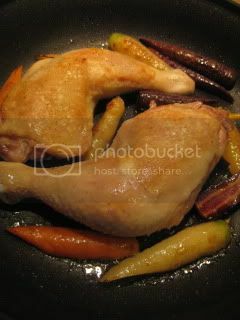 The ingredients were assembled and baked in the 450F oven for about 25 minutes. 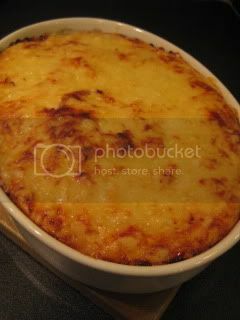 Here’s the non-vegan version with a lot of Gruyere cheese on top. 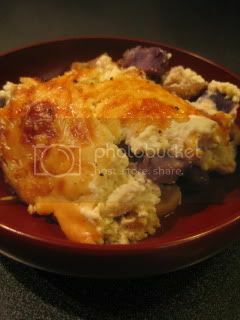 Also, instead of purple yam, I used sato-imo (taro...which also great in this dish). So gooey and nice. This is the lighter less cheese version. Also very nice. And, voila, here is the complete shojin (Buddhist-style vegan) version, with no cheese (or garlic - because we don't use garlic in shojin cooking). 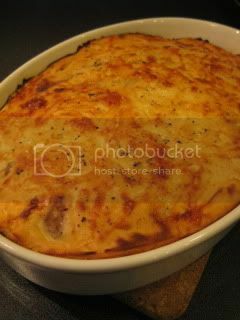 The surface looks almost like baked soufflé. The inside is so creamy and packed with umami flavors from sake, miso, etc. The vegetables were so hearty and tasty. 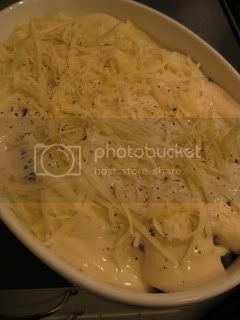 Honestly, I didn't miss the cheese in this dish at all. The flavor was so pure. So, this is my favorite version. WOW. 1. 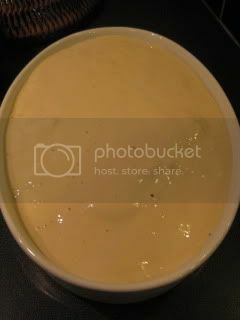 In a food processor, combine the ingredients for the sauce, except for the soy milk. Puree the ingredients. 2. Add 1 cup soymilk and continue to puree. Add more soymilk if necessary. Set aside. 3. 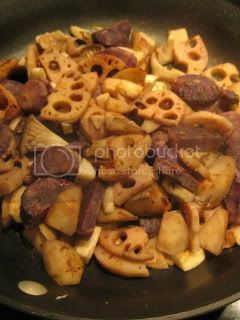 Sauté the burdock root and lotus root in some olive oil in a pan until they are lightly browned over medium-high heat. 4. Add about ½ cup water and cover. Turn down the heat to medium, and cook until the vegetables are crisp-tender. 5. Add the yam and a little more water if necessary. 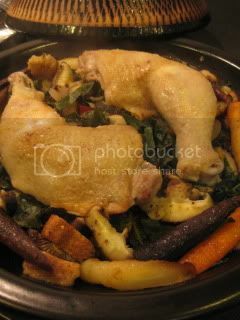 Cover again and cook until the yam is tender and the water is evaporated (about 5 minutes). 6. Add the mushrooms and garlic (optional) and sauté until the mushrooms are cooked through. Season with salt and pepper. Remove from the heat. 7. 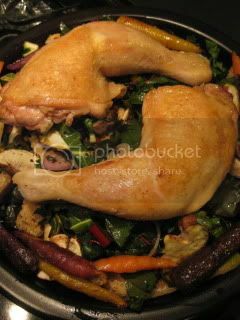 In a large enough baking dish, drizzle some olive oil to coat the inner bottom. Spread the cooked vegetables and pour the sauce over them. 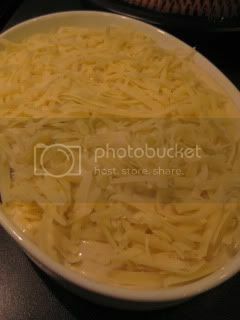 Spread some shredded Gruyere cheese on the surface if you like. 8. Bake in the 450F oven for about 25 minutes or until the surface is nicely browned. This year, my passion for sake-kasu (sake lees) has grown so much bigger. I always have loved sake-kasu and dishes made with it, but my use of sake-kasu used to be limited to traditional soup/ hot pot style dishes and making marinade for fish (or sometimes pork). 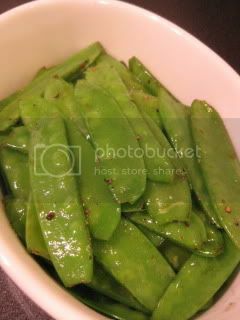 But lately, I’ve discovered the versatility of this magical ingredient, and have made so many wonderful dishes with it. 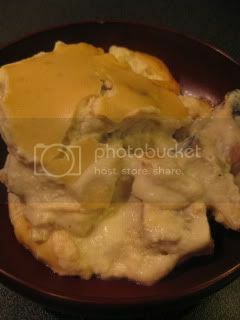 Sake-kasu can be used for savory dishes, dessert, or even drinks. It can be used hot or cold. Best of all, sake-kasu has wonderful natural flavors packed with UMAMI. 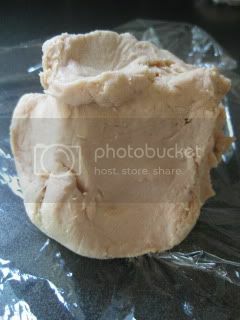 Just like what okara (soy pulp) is for tofu, sake-kasu (sake lees) is a by-product of sake (drink). In other words, it’s leftover after making sake. Sake is made from rice, koji (mold), and water. After the process of alcoholic fermentation the liquid (finished sake) is filtered and leaves mash behind. This mash is sake lees. There are two general types of sake lees. Hard-press sake-kasu from making lesser grade (and less-polished rice sake, like “Honjozo”) sake, and soft puree-like sake-kasu from making higher-grade sake (like more-polished rice sake, “Ginjo” or “Daiginjo”). This type is soft and also contains more residual alcohol, because sake is often filtered through hanging bags with natural gravity. This is hard-press sake-kasu. It’s great for stew, marinade, or baking. It’s also most suitable for making pickles (but I can’t eat pickles…). 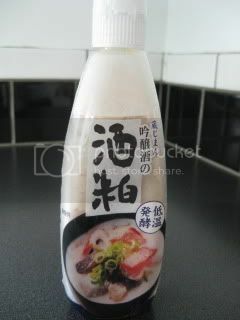 Soft-type sake-kasu is lately found in convenient tube packages, the flavor is cleaner and more pure because it’s made from more polished rice. 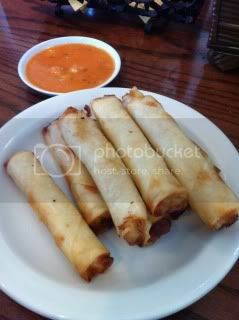 It’s great for soup, appetizer (salad) dishes to use without heating, or drink. For the hard-press sake-kasu, also just like okara, sake-kasu is known for its remarkable health benefits (different benefits from okara’s). Sake-kasu’s known benefits include helping lowering cholesterol level, making blood flow smooth, making healthier skin, to name a few. In Japan, you also find sake-kasu beauty treatments such as sake-kasu massage, facial mask, or even sake-kasu bath! In Japan, winter is the high-season for sake making, so it’s naturally also the high-season for sake-kasu. You can also find some premium-quality sake-kasu from high-end Daiginjo, etc. Here in LA, your choices will be limited, but you can still find decent-quality sake-kasu at Japanese grocery stores. 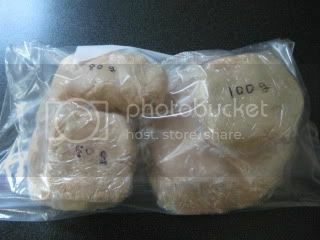 I buy a big batch of sake-kasu and portion into small batches based on weight, so they are conveniently ready anytime I need a certain amount of it. 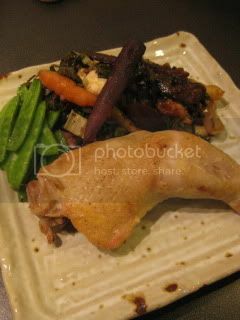 Hopefully I can post more sake-kasu dishes pictures in my blog. You can find my sake-kasu nabe (hot pot) and sake-kasu cake pictures from my recent post here.